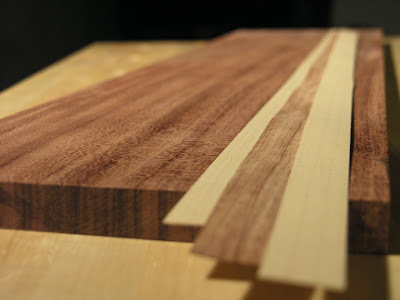 Over the weekend I started preparation for cutting up all my wood up into individual parts used for the build. 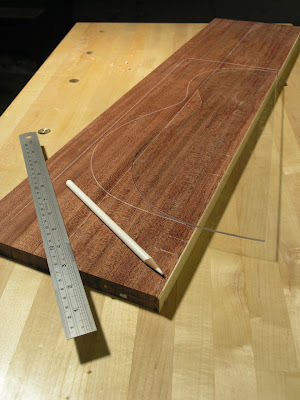 As I wanted to use the same wood for binding as I am for the back and sides, as the standard for classical guitars is, it sort of made sense for me to cut it all from the same stock. 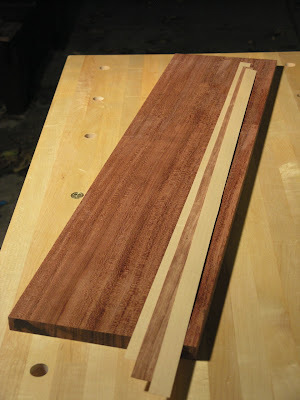 So before I started to resaw my bubinga, the first thing I did was to cut on the three strips of veneer; maple - bubinga - maple to size, just slightly wider that the back and sides board. 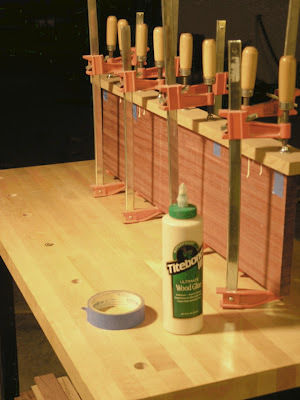 Then I glued them on the with Titebond III, first fastening them in position with masking tape and then clamping them on with a MDF caul. Unfortunately, I was a bit too generous with the glue, hence the large runs down the side. At the time I was thinking about wiping it off but ended up leaving it to dry for later clean-up. When the Glue had dried overnight I scraped off most of the glue though some still remained as evindent in the last photograph. I will deal with that later.